Our projects-in- the-making range from scholarships for students to become professionals in their own community to the development of successful farms that provide livelihoods for numerous families and orphans. Three of our current projects are described below. The first project is to raise funds for a scholarship for a young women from Cambodia whose desire is to serve people experiencing eye problems. With malnutrition and burning sun, the eyes suffer in many developing countries. The second project is to help the children who were orphaned by the Cyclone Nargis. They need everything!! 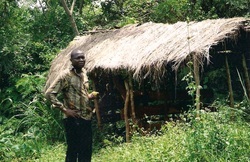 And the third project is guided by the goal to establish a working farm in Uganda that will support families in general. and orphans in particular.The second two projects involve both fund-raising and in-the-field work. We invite you to participate in raising funds, collecting supplies, bringing supplies on a Service and Culture Tour, and working on site in Uganda, mainly agriculture and construction. It is not necessarily that you are experienced in these areas but are willing to help others who have such skills. April 2017 was our first work with the children who live near and work in the dump grounds just a few kilometers outside of Phnom Penh. We worked through the government authorities who ran this area. They were highly cooperative and appreciative of our work. Asking them what they needed, they told us the families of these children are extremely poor therefore making it necessary for the children to search for metal, plastic and other objects that might be sold. They gave us a list of the things most needed: rice, oil for cooking, fish sauce, vitamins, first aid supplies, and clothing were the essentials. On our visit with the children, each child received a large black plastic bag filled with the requested items in addition to a few fun things that each child would like such as stickers, puzzles, picture books. ​It is difficult to image what life is like for these children. With their smile and hand wave, they are expressing thanks and joy that they can bring these supplies home to their families. Their homes are shanties built along side the large dump ground. Our plan is to continue this project on each of our visits to Cambodia- there is no end to the need. On the left you see the children each with their large bag, along with the truck we rented to transport the supplies. We invite you to join us in making a difference in these lives. 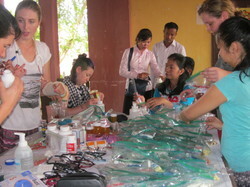 Below is a video of our work and a photo of one of our clinics held in rural Cambodia. Both medical and non-medical volunteers are needed for these clinics. These clinics are on-going and our aim is to hold one or two clinics a year. These pictures show examples of the aftermath of the Nargis Cyclone (2008) with winds in excess of 140 mph. 140,000 people died and 2.5 million were, and still are, affected. This cyclone was a category 4 and hit five townships in southern Myanmar (Burma). The difficulty in helping these people resides in the government’s resistance to foreign help. However, we have friends who live there and we work through them. You can see from the photo how fragile the house was in its original state. Winds of 140 mph left chaos, destruction and death. Many of the people who have suffered are the Karen people who comprised a large portion of the population in these townships. Construction of a school with concrete floor, wood walls, tin roof, windows, and a door. Pay a fulltime teacher for 2 years at 900.00 USD per year. 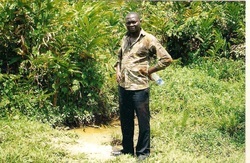 Our Ugandan partner, Benson, stands on newly acquired land which is our first purchase for this project. 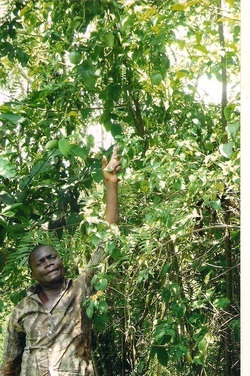 He is holding a piece of passion fruit picked from the tree pictured on the far right. This land has natural water and a makeshift hut not fit for habitation. The water is a must for growing crops. There is a railroad nearby which could transport our products and earn income. The goal is to create a working farm that could help support other families in need, as well as orphaned children. 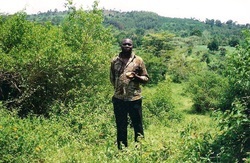 Uganda is a country with abundant resources including rich soil and people willing to work. We become more complete as individuals when we help others. Doing such service in collaborative ways results in enriching all of our lives. These projects will become possible with your help. Thank you!!! Copyright (2013) All Rights Reserved by Lanna Kingdom Projects.